What is a Strip Heater and how to select one? What is a strip heater used for? The proper sheath material for resisting any rusting and oxidizing inherent in the process or environment and for withstanding the sheath temperature required. Standard sheath materials are rust resisting iron, chrome steel and Incoloy (NS Series only). Stainless steel and Monel sheaths are available at an additional charge. Maximum work and sheath temperatures are below. The watt density of the heater element, or watts per square inch of heated area. This should be low for heating asphalt, molasses and other thick substances with low heat transferability; it can be higher for heating air, metals and other heat conducting materials. (See curves for determining allowable watt densities). The calculation of total heat requirements for an application is outlined in the Technical Section. For assistance, get in touch with an OMEGALUX™ applications engineer who will be glad to help solve your heating problem. Once total heat requirements are established, the quantity, size and ratings can be decided. Plan for enough strip heaters to permit even temperature as required by the process. The sensor for the temperature control should be clamped to the working surface for accurate control. In the case of air heating, place sensor where the desired temperature is needed, but not too far from heater to help avoid undershoot and overshoot. Use more heaters of a low watt density to obtain the required kW capacity. Reduce the kW capacity needed by reducing heat losses and allowing for a longer heat-up time. Finned strip heaters are extremely efficient and dependable as a heat source for hundreds of industrial and commercial applications. They are used for both forced and natural convection air heating. Channel Strip Heaters have proven to be extremely efficient and dependable as a heat source for surface heating in hundreds of industrial and commercial applications. The rectangular tube gives full surface contact when used in a milled slot to provide maximum heat transfer area. An economical, practical and reliable heat source capable of providing uniform heat transfer to flat surfaces. 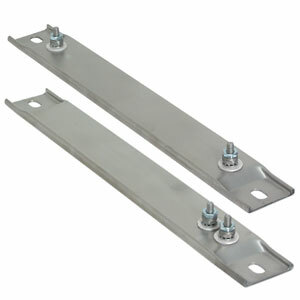 Mica insulated strip heaters are used in hundreds of industrial and commercial heating applications. When high operating temperatures are needed, watt density must be limited in order not to exceed the maximum sheath temperature. Watt density is given in the "How To Order" table for each strip heater. In general, a viscous material with low thermal conductivity requires a low watt density. High watt densities can be used with thinner liquids and with materials of high thermal conductivity. Premature loss of the element due to excessive temperature may result if the material's heat-take-away ability is low. Also, the material may be charred, carbonized or its chemical makeup altered by overheating.